Molecular biology students from across Lebanon competed in a poster contest where they presented their scientific research on LAU’s Byblos campus. Students, faculty and visitors examine the posters and interact during the exhibition. 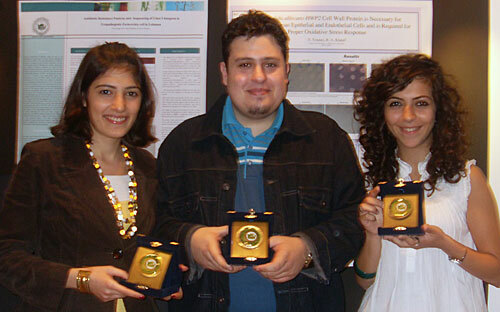 From left: USJ student Elise Abi Khalil (first prize winner), LAU student Rami Abou Zeinab (first runner-up) and LAU student Najwan Fares (second runner-up). 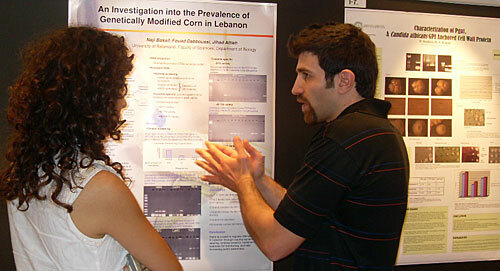 LAU student Najwan Fares (left) and University of Balamand student Naji Bassil exchange scientific information. LAU student Samer Younes (1st from right) defends his study in front of the jury. Jury member Melissa Plourde from LAU inspects the designs of the students. 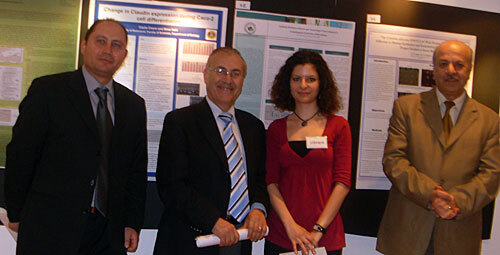 From left: Dr. Costantine Daher, chair of LAU's Natural Sciences Department in Byblos; Dr. Fouad Hashwa, dean of the School of Arts and Sciences in Byblos; Maya Farah, science lab senior technician and conference coordinator; and Dr. Abdo Gerges, president of the Lebanese Association for the Advancement of Science. Graduate molecular biology students from universities across Lebanon presented their latest scientific research visually, through posters they designed, in a competition at the Second Annual Molecular Biology Poster Conference organized by LAU’s Natural Sciences Department in Byblos on May 14. Students from LAU, the American University of Beirut, University of Balamand, Holy Spirit University of Kaslik, and Université Saint-Joseph discussed their topics and honed their communication skills, while researchers from LAU, <abbr title="Universite Saint-Esprit de Kaslik (Holy Spirit University of Kaslik)">USEK</abbr> and the National Council for Scientific Research informed students of their scientific studies during a seminar before the opening of the poster session. 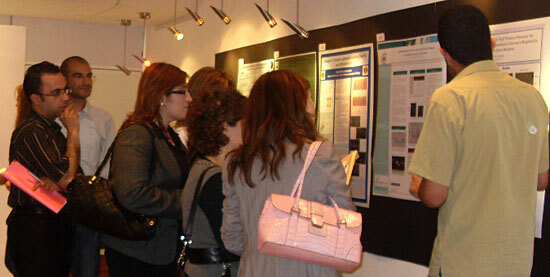 At the Rima Hourani Exhibition Hall, students explained and defended their research on topics such as the prevalence of genetically modified corn in Lebanon; an analysis of breast cancer in Lebanese patients; and anti-tumor effects of wild carrot water extract, while juries Dr. Sima Tokajian and Melissa Ploudre from LAU, Dr. Majida Jalbout from <abbr title="Universite Saint-Esprit de Kaslik (Holy Spirit University of Kaslik)">USEK</abbr>, Dr. Roula Abdel Massih from <abbr title="University of Balamand">UOB</abbr>, and Dr. Mireille Kallasi Awad from <abbr title="Universite Saint-Joseph">USJ</abbr> scrutinized their work. LAU student Najwan Fares has been conducting studies for the past two years on a plant found only in Lebanon, the Nasturtium officinalis. “I’m working to see its effect on humans; if it lowers cholesterol, triglyceride, blood sugar, and if it can be a curative or preventative plant for skin inflammation,” said this year’s second runner-up who participated last year as well. Dr. Costantine Daher, chair of the Natural Sciences Department in Byblos, explained that such conferences are key platforms for promoting interaction and research. Students also improve the quality of their work and develop new ideas, he said. For students like Fares, participation in such conferences is a stepping stone into Ph.D. programs in which such experiences are often required. “This conference is important because it helps us learn more … and go more in-depth in molecular biology,” said Fares. 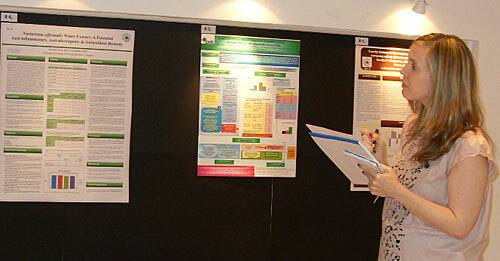 The evaluation of the posters was based on the topic’s importance, the student’s performance, as well as the poster’s layout, title and design. <abbr title="Universite Saint-Joseph">USJ</abbr> student Elise Abi Khalil ranked first, winning $500 donated by the Lebanese Association for the Advancement of Science. The first runner-up, LAU student Rami Abou Zeinab, received a $300 voucher and Fares a $200 voucher, both from Virgin Megastore and donated by Byblos Dean of Students Mars Semaan. Read the story on last year’s molecular biology poster conference.